This orchid is grown on a smallish rock on the ground, with overhead shade and early morning sun. It gets better every year; this year there are 16 flower spikes. 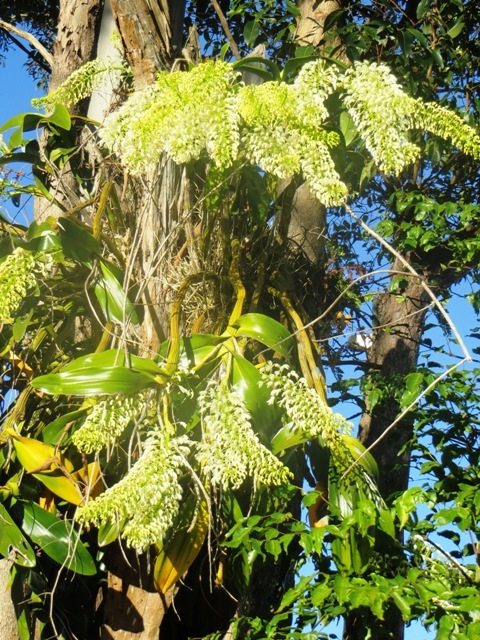 Sue Horder wrote to me recently asking for help with her king orchid (Dendrobium speciosum), also known in Australia as the rock orchid. This really is the king of orchids for its sheer size and magnificence, once it reaches sufficient maturity to produce four or more spikes, And it’s very easy to grow – provided you give it the right conditions. All a king orchid actually needs is something firm on which to grow and a position in light shade or direct sun in the morning only. The fork of a tree that’s either briefly deciduous in late winter, or has a light canopy of foliage (such as a jacaranda, erythrina or frangipani) is ideal Or a rock with light overhead shade. The orchid in the picture (above) is grown under the eaves of a house with an easterly aspect; it gets plenty of early morning sun in the cool season but is shaded from direct sunlight for most of the day in summer. This type of orchid is an epiphyte, which means it occurs naturally on trees or rocks where it gets strong support, good aeration and perfect drainage. The roots can spread where they will without constraint. Nutrition is supplied by insect carcasses and plant debris, with some minerals taken from the bark or rock over which the roots spread. An epiphyte is not a parasite so the plant does not take its sustenance from the host. Grown in the fork of a tree, this fine specimen has spread its mat of thick, fibrous roots over the bark, giving it very strong support. In cultivation, king orchids should be given a growing environment as close to nature as possible. If a tree branch (preferably a fork, for stability) or a large rock is not available then a tree stump will do. If you have bought your plant from a garden center then it will be on some sort of support already and you merely have to place this somewhere the orchid has plenty of space to grow – because king orchids can get very large indeed. If you have obtained your plant from, say, somebody else’s garden then you will need to fasten it firmly in place with string or thin rope made from organic fibre that will rot away once the plant roots have established themselves in the new habitat. (see photos). A wicker basket also makes a suitable growing environment because it provides perfect root drainage if filled with bark and leaf litter or an open orchid-growing mix. A couple of small rocks will add stability and enable to orchid’s roots to extract important minerals. The basket can be placed on the ground (slightly raised on rocks or timber is best) or suspended on strong supports. Choose a position which is lightly shaded all day or which gets direct sun only in the early morning (no later than 10 a.m.). plant. Always bear in mind that these are plants that like a lot of moisture in the air for most of the year and don’t like aridity. So the important thing to remember is that the root system SHOULD NEVER BE WATERLOGGED YET NEVER ALLOWED TO COMPLETELY DRY OUT FOR TOO LONG. A dry spring, however, will produce larger and more prolific flowers and at this time just a light misting is all that’s needed. 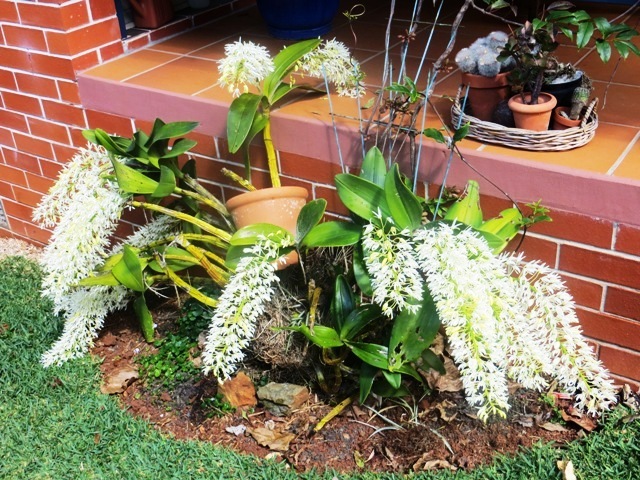 Feeding king orchids is not really necessary, especially with tree-grown plants. However, blooms will be more and better if you give your plant a feed once a month from June – August, using a cheap soluble all-purpose formula such as Thrive or Aquasol mixed in a spray bottle at half the strength recommended for pot plants. The less “natural” your orchid’s growing environment the more it will need to be artificially fed because it may not be able to get adequate nutrition otherwise. I fertilise my king orchids again after flowering is finished, to promote new stem growth, and again in December – January. I have one “kingie” in a tree and that one I never feed at all! If grown as recommended here you shouldn’t have any problems. I’ve never seen an insect attack on a king orchid that was worth bothering about though you might like to remove unsightly spider webs if they form (I don’t: I think they help feed the plant and also keep more harmful insects away). Stem rot can occur from injury that allows harmful bacteria to enter the plant – if you see any obviously unhealthy browning of the stem, cut it away with a clean and sharp knife. The most common problem is root dry-out during drought. If this occurs the foliage will droop and the stems will look yellowish and unthrifty. Just keep watering the plant well (these orchids are amazingly tolerant of hard times) until it responds with fresh new growth. It’s easy to move a king orchid. Just cut the roots very carefully with a sharp, clean knife and remove gently from the supporting structure. Pack in damp hessian (burlap), peat moss or some other soft, moist material and keep this with the plant when you transfer it to its new home. Tie firmly in place (including the wrapping material which will supply protection and moisture), spreading out the roots gently over the new surface. And that’s it. A very easy plant that, if given the basics of horticultural care, will reward you with splendid flowering that just gets better every year. Do remember, though, that this glorious flowering period is brief, so don’t put your plant where it needs to offer a spectacle for the rest of the year. King orchid growing in its natural habitat, high on a mountainside overlooking a ravine. here it gets its moisture from summer rains and frequent mist. 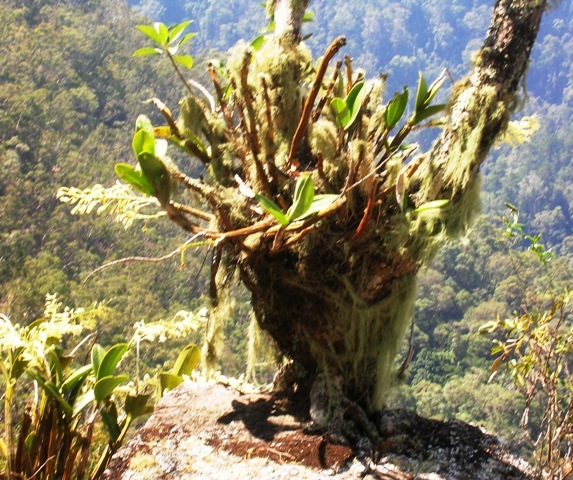 An epiphytic plant like this won’t thrive with its roots in deep soil – such as a pot.